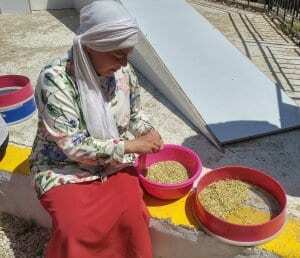 Barley Harvested in Preparation for Third Temple Wave Offering [PHOTO/VIDEO SPREAD] - Breaking Israel News | Latest News. Biblical Perspective. 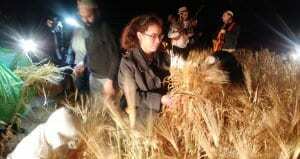 On the second night of Passover, this past Saturday night, dozens of men, women and children went out to the fields to harvest barley, not so much as a reenactment but a real Temple-related Passover ceremony. 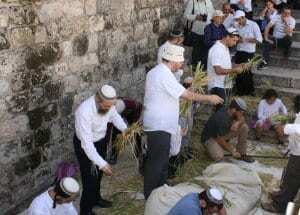 The following day, the harvest was brought to Jerusalem where it was turned into flour and Kohanim (Jewish men descended from Aaron the Priest) performed a full-dress rehearsal for the Wave Offering, which will take place once again in the Third Temple. 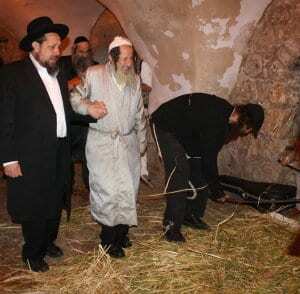 Preparations for the event began on Friday before the holiday of Passover began. 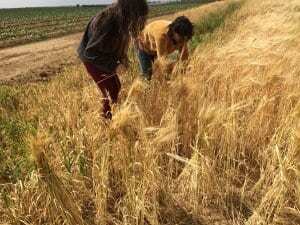 Members of the nascent Sanhedrin and representatives from the United Temple Movements went out to a field of barley near Ruchama in the Negev (southern Israel). They oversaw the selection of the finest sections of grain and tied them into sheaves, leaving the stalks connected to the soil. 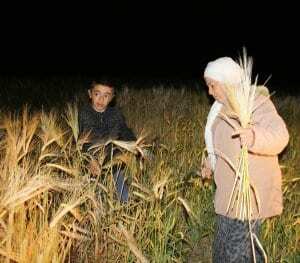 On Saturday night, they returned, accompanied by many others who came to take part in the mitzvah (Biblical commandment). 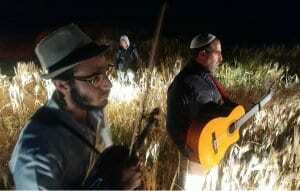 As are most Temple related activities, the harvesting was done with musical accompaniment. 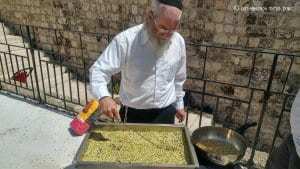 Approximately 450 pounds of barley were harvested and brought to King David’s Tomb on Mount Zion where it was beaten, the chaff was removed and the grains were sifted through 13 sieves. Finally, the grains were roasted and ground into a coarse meal. Olive oil specifically prepared for use in the Temple,was added, along with frankincense. 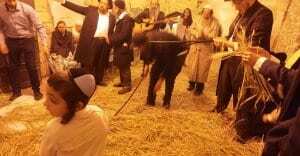 The result was presented in a reenactment of the Wave offering brought on the first day of Chol Ha’Moed (intermittent days between the first and last days of Passover). 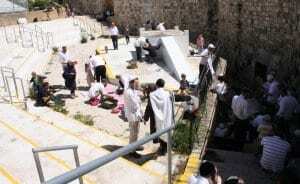 About 200 people participated in the event held in the Tekuma Park in the Old City of Jerusalem. 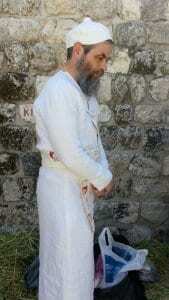 The Kohanim wore authentic priestly garments that conformed to the Biblical requirements. 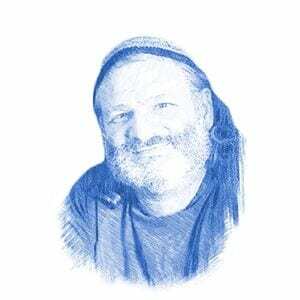 Rabbi Baruch Kahane served in the role of the Kohen Gadol (High Priest). In the Temple, a male sheep was brought as a burnt offering, but this was not done at the reenactment. 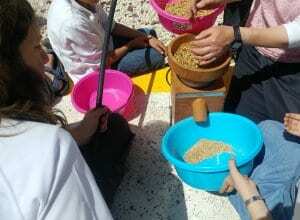 After this offering is brought, the new grain of the harvest year is permitted to be eaten. The leftovers of the sacrifice are kept by the priest and is listed as one of the twenty-four priestly gifts. On the second night of Passover, Jews begin counting 49 days until the holiday of Shavuot, when two loaves made from fine wheat flour are brought to the Temple as an offering.